It was another great week of fishing here. Day one of last week, lady luck prevailed with Polly Topolinsky collecting a pin for her 39lber. Guide Brent continues to fish well. 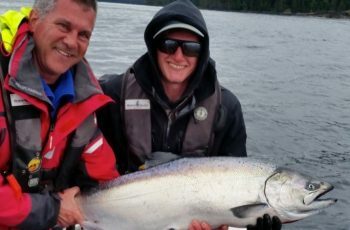 After a 46 release in early July, he shows us it was no fluke and put a cherry on top, guiding North Island first-timer Colin Frasier into a 47lber… A great release shot. 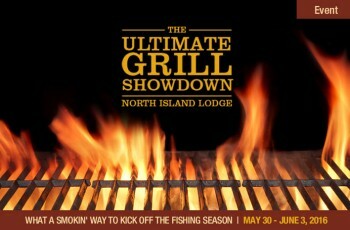 A little healthy competition around the lodge got Kauri fired up, guiding Ron Mowbray into a beauty 43lber, again left to swim another day. 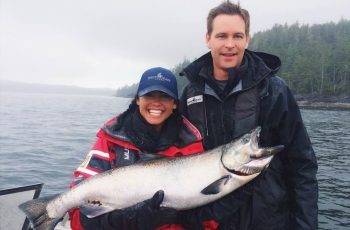 This fish earned Kauri a prime rib dinner delivered by Chef Walter himself on changeover evening. Not sure what the rest of the guys had for dinner that night! 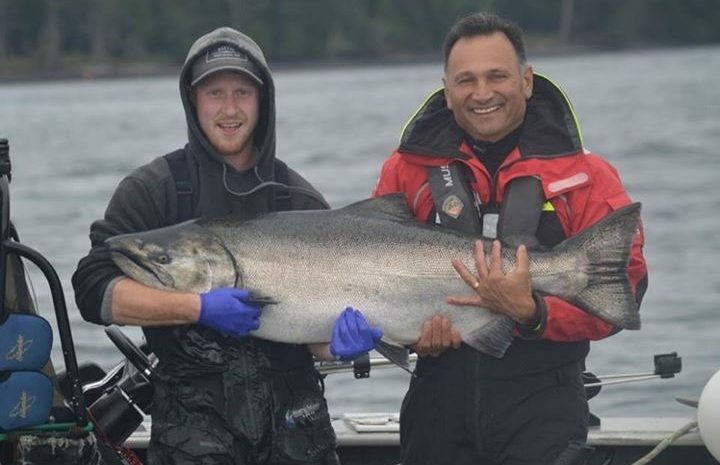 Guide DJ put his guests Chris Barr and Doug McLachlan into this set, 37 and 31lbs. Not what I would consider easy fishing, but recent halibut trips have been successful with a few showing in the 30-115 mark. 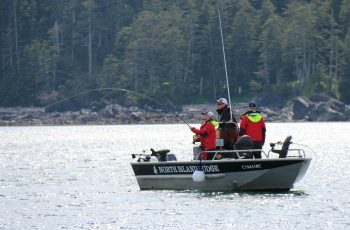 Lacy Island was producing good numbers of Chinook as well, but recent strong Northwest winds have limited the Westside fishery. The guides are waiting to pounce on the Lacy Island once things settle down. Staffer Celina Bettesworth gets photo credit for this great shot taken of Beal Cove. 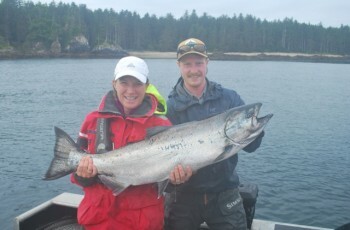 All in all another great week, as 2011 proves to be filled with Chinook. The past two days fishing has slowed a little, but just heard mumblings on the radio that Kauri is having a strong shift at Bruin Bay and some boats posting bigger numbers again at Cohoe Point. Good night from North Island.